John Humphrys, the voice of the Today programme for 32 years, is leaving the show at the end of this year. Harry Mount watches him in action - at 4.30am. It’s 4.30am in dark, empty, central London. High up in BBC Broadcasting House, a light blazes through a window. Behind that window is the small studio – the size of an average kitchen – of the Today programme. In this tiny space, the BBC records Radio 4’s most popular programme, with a weekly audience of 7.45 million people – a new record. The show is so embedded in British life that nuclear submarine commanders depend on it. If three days pass without Today being broadcast, that constitutes official evidence of a nuclear attack – the submarine commander is then allowed to launch a retaliatory strike. In 2017, the Today programme celebrated its sixtieth birthday. That year, Sarah Sands, the Evening Standard editor, became Today’s editor, leaving her old job to George Osborne, the former Chancellor of the Exchequer. For 32 years, John Humphrys, now 75, has sat with his back to that window. On the morning I sit in on the programme, he is interrogating David Davis, Secretary of State for Exiting the European Union. No one has done the show as long as Humphrys. Brian Redhead (1975–93) and Sue MacGregor (1984–2002) did it for eighteen years. Humphrys has now been getting up before 4am, week in, week out, for over three decades. Sleep dominates the presenters’ thoughts. Every extra minute of sleep counts. In exchange for the punishing hours, the presenters work for a show they’ve always longed to appear on. 17 years ago, Nick Robinson (a Today presenter since 2015) failed a two-day audition for the programme, when Rod Liddle was editor. ‘There was a reaction on the part of the audience that I was an annoying northern oik who was too chatty,’ says Robinson. Politicians also ache to appear on Today. Some ask to be grilled by Humphrys, Today’s Rottweiler. Some politicians, such as Liz Truss, the Justice Secretary, never appear – ‘She won’t talk to us, unfortunately. And we don’t often see Amber Rudd,’ says Humphrys. In the internet age, Today’s audience has grown. Nick Robinson has a theory why. He has been listening to the programme since the 1970s, when he was friends with Will Redhead, son of Brian Redhead. Robinson survived the 1982 car crash that killed Will Redhead. With Sarah Sands as editor, there are bound to be changes. The programme has changed enormously since 1957. Its first presenter was Jack de Manio. Other presenters have included Robert Robinson (1971–74), Barry Norman (1974–76) and Des Lynam (1974–75). The show, devised by Robin Day, was originally two twenty-minute slots wrapped around news bulletins. 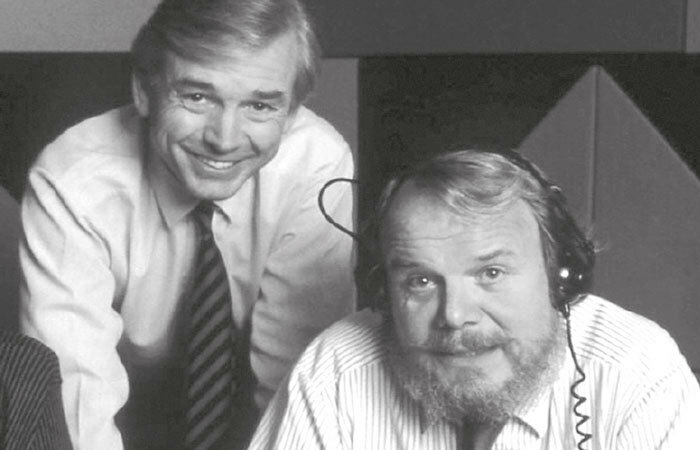 By the time Humphrys joined in 1987, it was similar to its current incarnation. Recent editors have subtly changed the programme.